88. Continuous rotary converted into intermittent rotary motion. 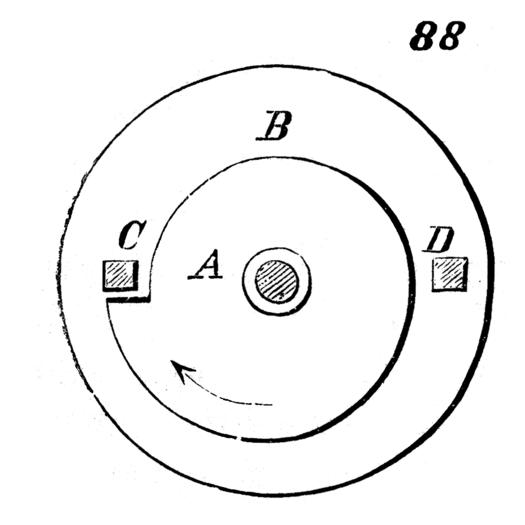 The disk-wheel, B, carrying the stops, C, D, turns on a center eccentric to the cam, A. On continuous rotary motion being given to the cam, A, intermittent rotary motion is imparted to the wheel, B. The stops free themselves from the offset of the cam at every half-revolution, the wheel, B, remaining at rest until the cam has completed its revolution, when the same motion is repeated.